Whey is recognized as a "value-added" ingredient because of its highly functional and nutritional properties. 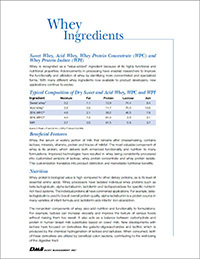 Advancements in processing have enabled researchers to improve the functionality and utilization of whey by identifying more concentrated and specialized forms. With many different whey ingredients now available to product developers, new applications continue to evolve.